Ideal for brunch or morning tea. Firstly I want to let you all know that, for at least the next month or so, I’ll probably only be posting once a week. Our house is currently for sale which means I’m banned from making a mess in the kitchen! Hopefully normal service will be resumed soon. For this week’s recipe I am taking advantage of Australia’s current glut of bananas which means that they are very cheap. I only bought the bananas yesterday but that is fine as they don’t need to be over-ripe to make this recipe. 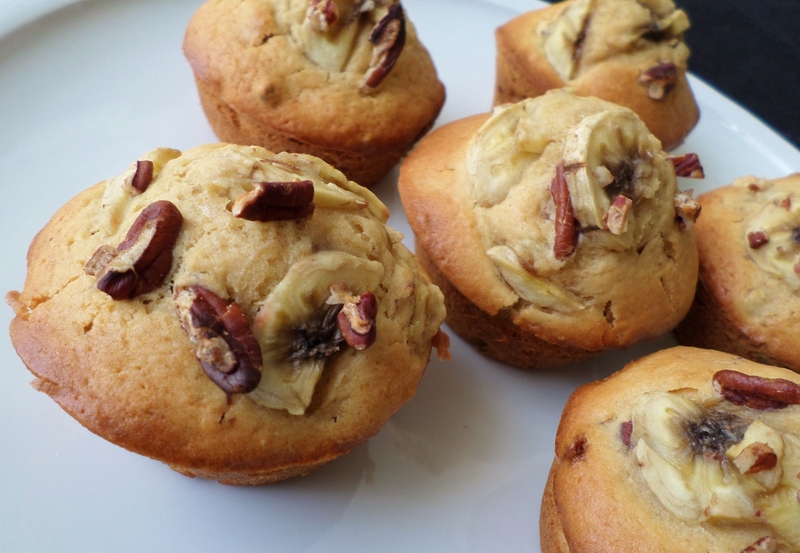 I love how the pieces of banana appear in each bite – it is a great texture combination with the crunchy pecan nuts. 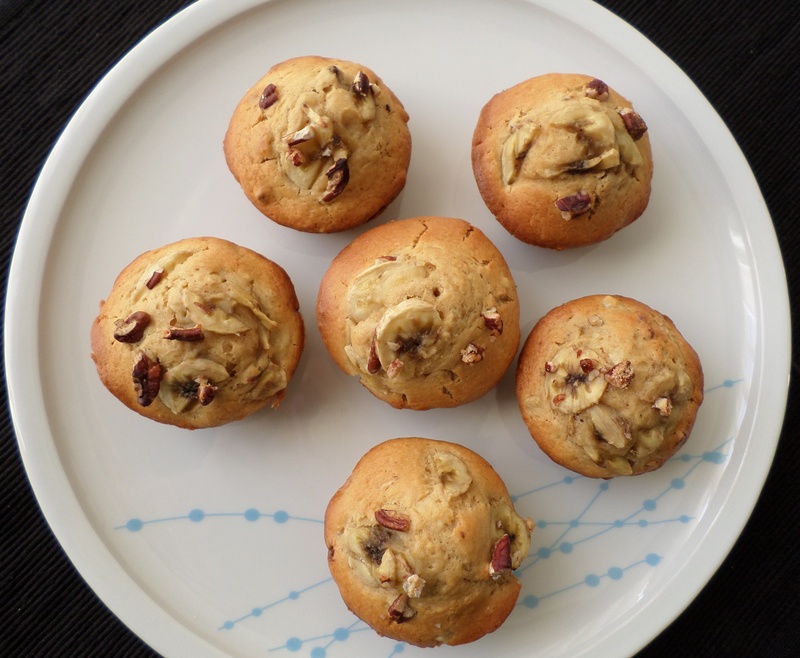 The muffins are light enough to enjoy in the morning with a cup of coffee, and would also be great for packing up to take to the office. Heat your oven to 200C/180C fan forced/390F and spray a 12-hole muffin pan with a little cooking spray. Put the flour, baking powder, brown sugar, diced banana and chopped pecans into a large bowl and stir to mix. Put the milk, oil, eggs and vanilla into a jug and whisk to combine. Add the liquid from the jug to the other ingredients in the bowl and stir until just combined. Do not over-mix as your muffins might come out tough. Divide the batter between the holes of the muffin pan. Bake for about 25 minutes, or until the muffins have risen and are golden brown. Remove from the oven and leave to cool for 5 minutes in the pan before turning out onto a wire rack to cool completely. 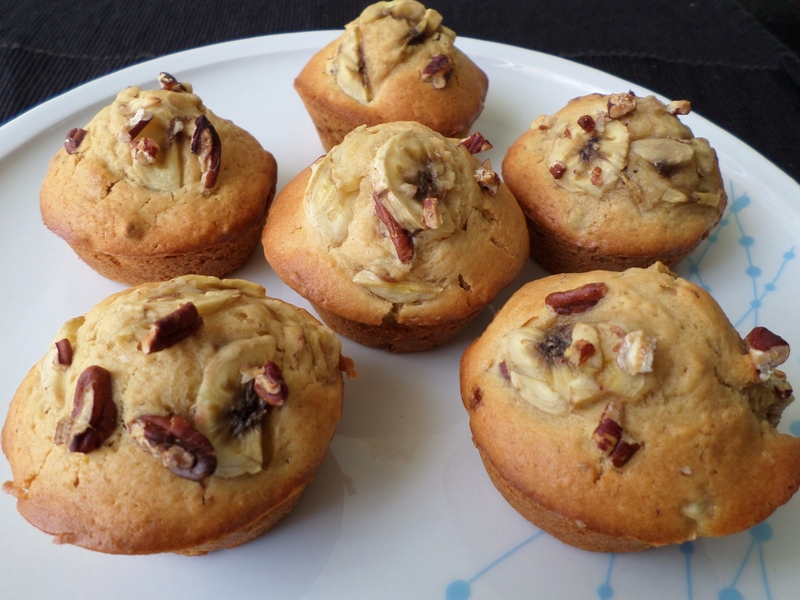 This entry was posted in Baking, Snacks and tagged Baking, Bananas, Breakfast, Brunch, Food, Muffins, Nuts, Pecan, Recipe, Recipes, Snacks. Bookmark the permalink. Wow! These look wonderful! Thank you so much for sharing! ah, I am going to experiment with this bannan bread recipe, hopefully it won’t be as dull as mine are usually 🙂 Thank you! keep the recipes coming.